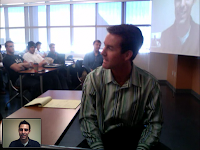 Sean Callahan, one of my former students at Cal State San Marcos, is on his 4th entrepreneurial venture, AddsYou.com. It's likely that you haven't heard of this site yet, but I'm guessing you'll be hearing more and more about AddsYou.com in the coming months as they near their alpha release in late November 2008. While it's not uncommon for me to have guest speakers in my Creativity, Innovation, and Entrepreneurship course, it is uncommon for the guest to be 8 time zones away while visiting with our class. To facilitate this, Sean and I used the video chat feature of Skype paired with the iSight camera and onboard mic on my MacBook Pro. After linking my Mac to the classroom projector, speakers, and wireless network, we were on our way to a makeshift (and inexpensive) distance education solution. We were able to see him clearly and he could even hear questions from the back of the classroom. Not bad, at all! Sean did a masterful job sharing his experiences as a serial entrepreneur over the past 10 years. He paid particular attention to the aspect of user observation and early prototyping and the important role these two concepts play into ongoing innovation. I can assure you, my readers, that Cal State San Marcos is proud of Sean Callahan and the entrepreneurial spirit that he exudes. Best wishes to you, Sean!